Ingredients: sugar, cocoa butter, whole milk powder, cocoa mass, emulsifier: soy lecithin, natural vanilla. Added ingredients: Guatemalan coffee beans (cocoa solids 33% min; milk solids 20.5% min). Coffee and chocolate is a classic combination. Using Guatemalan coffee beans, roasted locally by York Coffee Emporium, they perfectly compliment our silky smooth milk chocolate. 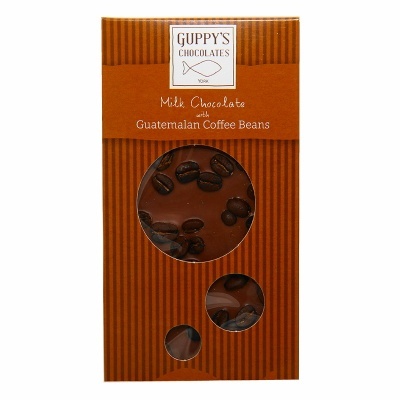 The beans are sweet and aromatic with a fruity start, reminiscent of plums and cherry, which fades to a milk chocolate finish. Delicious!